Once a prime trophy water, Lake Dulverton has suffered significantly from periods of drought since the 1980’s and has dried up on several occasions since then. Most recently, only the small ‘coffer dam’ – the small section at the base of the main lake – remained as an aquatic refuge. Our sister was heading down to Oatlands to do some observing at the Moto Trials today, Connor and I decided that we could be dropped off at Lake Dulverton, as we have never fished this lake before. We loaded up the fly rods due to knowing that this Lake is known for being VERY weedy. My son, Alex & I took a slow trip to Launceston (for my niece's 21st celebration) on Saturday (17th Aug) with intent to fish Brumby's Creek out of Cressy but stopped by Oatlands at Lake Dulverton. Its level was down but should fill up perhaps after the northern weekend rain. Got this nice one from Lake Dulverton last Friday on a wet. 5 3/4lb, 23 inches long, feeding on freshwater mussels, daphnia and snail. 6 hours fishing and only the one chance! 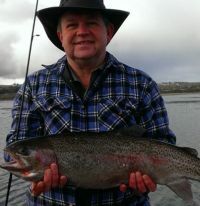 Hey all, thought you might like to see some photos because we didn't see many anglers out. This was at Lake Dulverton opening morning, a 3lb and a 4.5lb brown that lost a fight with the new Rapala x-rap rainbow minnow. We had the lake to ourselves for all but 1 hour. To cold and wet I`d say for most. Dropped another 2 or 3 as well.